Arriving in Passau for the first time, you could be forgiven for thinking you'd landed in Italy instead of Germany. The city has a very Italian atmosphere that's led to its nickname, Venice on the Danube. 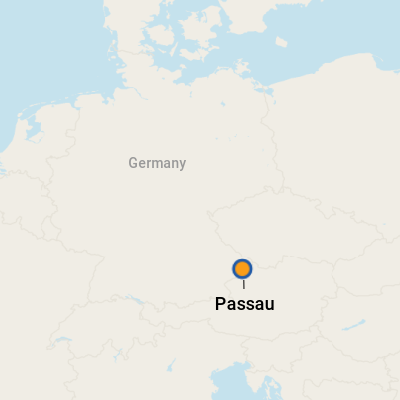 And indeed, Passau was part of the Roman Empire for more than 400 years. When most of the city was destroyed by fire in 1662, it was rebuilt in Italian Baroque style, reflected in the vast cathedral, churches, squares and former homes of wealthy merchants. Today, as you stroll through the pretty streets, you'll notice a plethora of pizza and pasta restaurants rubbing shoulders with eateries that serve up hearty German fare. While Passau has an undeniably touristy feel, it's a very attractive destination boasting a legacy of wealth built on the salt trade and, during Renaissance times, the crafting of knives and sword blades. The city occupies a unique location on the confluence of the rivers Danube, Inn and Ilz in southeastern Germany, close to the Austrian border, and so it's also known as the City of Three Rivers. But the rivers haven't always been the city's friends: Passau has repeatedly been flooded by Alpine water swept along the Inn. High water marks on the side of the town hall bear witness to the flooding; the highest date back to 1501, 1595 and 1954, the latter marked at more than 10m (32 feet). Packed on a thin strip of land, Passau is easy to get around -- a major plus for visitors -- thanks to its small size. Beyond the long riverside promenade walk, lined with lookalike souvenir shops and some decent eateries, lies the picture postcard old town, with traffic-free narrow streets made for meandering and many of the main sights. The sightseeing high spot, in more ways than one, is St. Stephen's cathedral, high up in the Old Town, home to the world's largest cathedral organ. Dominating the Danube side, opposite the dock, is the Veste Oberhaus fortress, which is now a multiple-choice castle containing a museum, youth hostel and restaurant. Typically, riverboats dock in Passau after breakfast for a morning sightseeing tour, and passengers can opt to return for lunch back onboard or stay in town and have a meal independently in one of the many restaurants. River cruisers are then allowed free time to explore on their own before sailing in the late afternoon. River cruise vessels dock at the 14 moorings on Donau Lande, the main waterfront area that is within easy walking distance of the Old Town and main shopping streets. There is a tourist information center and four public toilets on the dockside. For visitors who don't want to venture too far afield, there are plenty of shops and a wide choice of restaurants across the street, plus attractions that include the Glass Museum, with dazzling exhibits of European glass including Baroque, Rococo, Art Nouveau and Art Deco pieces; and the 17th-century St. Paul's Church. Some steep, cobbled streets and flights of uneven steps lead down to the Inn River, a popular stop on many guided walking tours, so anyone with disabilities or walking difficulties should check first before setting out. For wheelchair users, the tourist office has produced a map of accessible streets. On Foot: The old town, the main tourist hub, is directly opposite the waterfront and easily walkable. By Bus: The City Bus service is cheap, and the Central Bus Station, on the western side of the Old Town, serves outlying districts. From March to November, a shuttle bus runs from the town hall to the Veste Oberhaus every half hour from 10 a.m. to 6 p.m. The Passau Card, available at the tourist information center on the dock, provides free public transport and entry to museums within a 24-hour period. By Taxi: There are taxi stands around the town, and you can call Taxizentrale Passau at 0851-5 73 73. Germany's currency is the euro. For current currency conversion figures, visit www.oanda.com or www.xe.com. The nearest ATM's are a five- to 10-minute walk from the point, in the pedestrian street Ludwigstrasse and at the corner of Heuwinkel and Rosstranke. All major credit cards are accepted in shops, restaurants and cafes. German is the official language. English is widely spoken at shops, restaurants and tourist attractions. Passau has plenty of international and regional restaurants to suit most tastes. The local Bavarian cuisine is noted for its rib-sticking qualities. Think of large, salty pretzels served as appetizers, sausages accompanied by sweet mustard and schweinsbraten (a national dish of pork, gravy and dumplings), followed by apple strudel -- and you begin to get the idea. With the longest brewing tradition in the world, Bavaria is home to half of all German breweries. On average, Bavarians consume 150 litres (40 gallons) of beer a year, and Passau's bars and beer gardens provide a wonderful opportunity to soak up this great tradition. With daily specials from 11 a.m., the Bayerischer Lowe, or Lion Tavern, is a 10-minute walk from the dock at Dr.-Hans-Kapfinger-Strasse 3. With a large, covered beer garden, it serves local specialities and is one of the rare breeds of German restaurants that pays a nodding acquaintance to vegetarian dishes. It's open all day, so cruise passengers can drop by at any time. Tuck into a pork fest at Hacklberger Braustiberl, a restaurant and beer garden specializing in Bavarian cuisine. An inexpensive, fixed-price lunch is served daily from 11 a.m. to 2 p.m. The main menu includes sausages in all kinds of guises and a choice of schnitzels influenced by nearby Austria. Located in Brauhausplatz 7, it's a 20-minute stroll from the town center, or you can get there by public transport. Feather-trimmed Bavarian hats and -- for the truly brave -- Lederhosen, traditional German breeches, featured largely in the souvenir shops lining the river cruise port and old town make good souvenirs, and CDs of organ recitals at St. Stephen's Cathedral provide lasting musical memories. The open-air markets held on Tuesdays and Fridays in front of the cathedral are great places for picking up crafts and local produce, and from November 29 to December 23, the square is the place to find one of Bavaria's largest Christmas markets, with stalls selling charming wooden toys, tree decorations and gifts.